Two monsoons dictate Cambodia’s climate. From November to April, a north-eastern monsoon brings cool air but little rain, while a south-western monsoon, which occurs from May to October, causes heavy winds and rains. During the summer rainy season rains tend to take place in the late afternoons. Generally speaking, November through June is the dry season and July through October is rainy. The temperature ranges between 27 C (80F) and 23 C (73F). Wear light, airy, covering clothing. The sun can be very intense, so bring a hat, sunglasses and sun block! Consider buying a traditional Khmer scarf (Krama) to keep the sun off your neck. Carry raincoat during the wet season, though you will probably only need it in the afternoon. You should have a mosquito repellent for sunrise and sunset hours. For serious temple exploration, a flashlight and compass come in handy. Sneakers are the best for exploring the ruins. The peak season is from November till March, best time of the year, no rain, not too hot, all activities in town operate, more flights, more bus & boat service. The Kingdom of Funan covered much of present-day Cambodia from the 1st to the 6th century, to be replaced by the even more powerful Kingdom of Angkor in the 8th century. 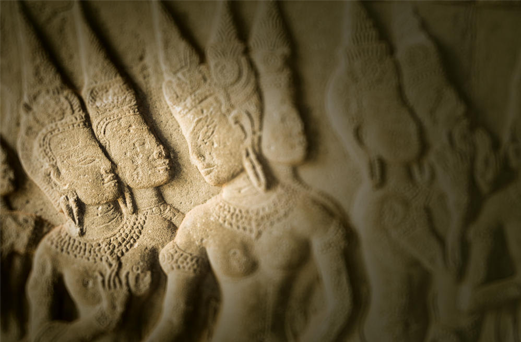 The legacy of this era is what draws most visitors to Cambodia; from the 9th to the 13th centuries Angkor’s rulers presided over the construction of one of the most astonishing architectural achievements in the world. While more than 100 temples remain, these magnificent structures are but a mere shadow of the fabulous religious capital that once stood here. Hundreds of wooden palaces, houses and public buildings are long gone. In 1864 the French added Cambodia to their colonies in Indochina. Independence was declared in 1953. In 1969 the war in neighboring Vietnam spilled over into Cambodia, and on April 17th, 1975, a Cambodian resistance group, the Khmer Rouge, took control of the capital, and proceeded to implement one of the most destructive campaigns of social re-engineering ever recorded. As the Khmer Rouge wished to create a peasant-led, agrarian cooperative, Cambodia’s cities were forcibly emptied and people were resettled in rural labor camps. Anyone with foreign ties or education was liable to be executed. By the time Vietnam invaded Cambodia in 1978 and overthrew the Khmer Rouge, between one in four and one in six Cambodians were dead. In the middle of 1993 the United Nations oversaw elections in Cambodia. The Khmer Rouge’s leader, Pol Pot, died of natural causes in April 1998. In Southeast Asia, revealing clothing is unacceptable off the beach. Shorts are generally fine—as long as they aren’t too short. People tend to dress as well as they can afford to – Asian people are often astonished by some travelers’ choice of dirty and tattered clothing. In terms of behavior, public displays of affection between men and women are considered shocking. On the other hand, it’s perfectly normal for a pair of men or a pair of women to link arms or hold hands. Upon meeting someone new, people may simply nod to each other or may shake hands. Using both hands to shake someone’s hand is a warm gesture of respect. The majority of men in Southeast Asia smoke. While flights are non-smoking, very few restaurants or bars offer non-smoking seating. Tap water is never safe to drink. During the summer months you should be drinking a minimum of 2 liters per day from sealed bottles. Do not accept water with broken seal. If you drink tea, coffee and alcohol you should increase water intake accordingly, as these drinks can lead to dehydration. Whatever you take, please bear in mind it is not recommended to drink with ice if you are not sure which water source they use to make ice cubes. Anyway, most restaurants have cold drinks in the fridge or you can have the restaurant waiters/ waitresses put your drinks in the ice-chest to keep them cold. Diphtheria and tetanus: Combined vaccinations for these two diseases are usually given in childhood and should be boosted every ten years. Typhoid: Vaccination takes the form of an injection or capsules. Meningococcal Meningitis: This vaccine is only recommended for travelers making extended visits to rural areas such as Rattanakiri, Udong, etc. Protection lasts for three years. It’s advisable to bring your own film although film can be purchased in all major cities. Obtain permission before photographing monks or the interiors of pagodas and temples. Never photograph a military installation or anything pertaining to the military as it may be viewed as a breach of national security. At large airports, the x-rays on the safety inspection machines are now film-safe. In smaller, provincial airports, however, this is far from certain, so it’s best to carry your film through the safety check by hand. Developers for digital cameras are also widely available in the major cities (Phnom Penh and Siem Reap). Camera stores around your hotel in big cities often offer CD burn service from memory card into a CD so that you can recycle your memory card for further photo ops. Simply ask your hotel staff or your guide for instructions. In general, Cambodia is very safe for travelers. Violent attacks are rare, although theft is a problem. When possible, secure your valuables in the hotel safe. Remember to record your traveler’s check numbers and credit card info—just in case. Do not leave your wallet or mobile phone in the back pocket of your pants or anywhere else that’s easily reached (like an outer zip-up compartment on a backpack). Be especially vigilant in markets and other crowded places like ports and train stations. Pick-pocketing and purse-snatching are more of a problem in Phnom Penh. Some thieves approach on motorcycles, grab your belongings and race off before you’ve realized what’s happened. If you ride in a cyclo (Pedi cab) do not hold your bag in your lap. Sit on it! Wearing valuable jewelry (especially necklaces that can be easily grabbed) is not advisable. Traffic is chaotic. If you choose to ride a motorcycle or bike, wear a helmet. When crossing the street on foot, move at a slow and steady pace. Fight the urge to weave and run! Walk slowly and traffic will flow around you. If your trip to Cambodia includes stops at beaches and mountainous areas, you will need clothes for all temperatures. A swimsuit, sunglasses, a hat, t-shirts, shorts that are not too revealing, long trousers, some light-weight, long-sleeved tops and a light jacket that is wind- and-rain-resistant will get you through most trips. If trekking is on your agenda, you will need sturdy footwear—plus lots of socks. Slip-on shoes or sandals are useful for visits to pagodas or people’s houses, as you’ll save time taking your shoes on and off. Larger cities like Phnom Penh and Siem Reap offer upscale bars and restaurants, so be sure to pack some clothes and shoes for a nice evening out. Leave your flashy jewelry at home. You should bring a money-belt to safely carry your travel documents and cash, and ensure that your luggage has a lock. Bring photo-copies of your passport and visa, plus some extra passport-sized photos if you’re applying for on-arrival visas, which is $20.00 per person Sometimes, you can be expected to walk into darkroom at the airport for an “up-to-date” picture for visa document. Cambodia’s currency, the Riel, exchanges at a rate of about 4,000 to US$1 US. Dollars are welcome. Credit cards and traveler’s checks are widely accepted in Phnom Penh and Siem Reap. Credit card advances for Master card, JCB and Visa are available at the Cambodian Commercial Bank on the corner of Pochentong and Monivong streets in Phnom Penh. For ATM machine, you can find ATMs in Siem Reap and Phnom Penh, cities of Cambodia. They are available 24hrs in many places in these two cities, might be one close to your hotel. The most convenience and globalize bank is AZN Royal Bank. Please ask your guide for more information. If you go shopping in Cambodia, bargaining is necessary. It is also recommendable to check prices of the same items in the neighborhood before reaching a deal. If you choose to ship items home, we highly recommend that you buy shipping insurance and check the policy details. As shops are not responsible for damages incurred en route, it’s better to be safe than sorry. Electricity in Phnom Penh and most of Cambodia is 220V; 50Hz. Electric power sockets generally fit two round pins. Three-pin plug adaptors are sold in markets in Phnom Penh and Siem Reap. - International telephone code is +855. To make an international call from Cambodia, you have to dial 001 or 007 followed by the country code. - Cambodia Emergency numbers: Police 117 / Fire 118 / Ambulance 199. FYI – none of them are working really well. Better to call our office emergency numbers. Wireless and cable internet access is available in most hotels throughout Cambodia and in internet cafes. The Departure airport tax is no more required as it is now included in the airfares. Higher-end restaurants will often add a service charge of five to ten percent to the bill. While tips are not expected in more casual restaurants and bars they are appreciated—waiter staffs earn very low wages. With small or family groups, we suggest tipping drivers about US$10 – US$15/person/day and guides about US$15 -US$20/person/day.